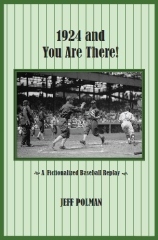 Of all my baseball writings, I’ve always gotten the best feedback from my first replay blog, “1924 and You Are There!” The daily diary entries of 17-year-old Phillie fan Vinny Spanelli, long before the Phillies had Phanatics, the story was written on the fly like all of my replay accounts, and gave readers an eyewitness look at homer-happy Baker Bowl and a baseball time long gone by. Interspersed with Vinny’s tale were daily dispatches from Detroit Tigers beat man Calvin Butterworth, but when I decided to publish the blog in book form, I had to do some serious editing to keep it from being 800 pages long. The result is now available on Amazon, in either printed or Kindled form. I can guarantee it’s a much breezier read now, though if you want to go to the old site and spend a day rummaging backward through the original uncut version, you’ll find plenty of deleted gems like this.